The “Flat Iron House” was built in 1611 by a wealthy merchant as a half-timbered house: It was built of wood and mud and only the basement is made of stone. Craftsman worked and lived in this house. Up to 1907, the ground floor was used by a butcher. After that the house was used as a private residence for various families. It´s rear is very wide and it´s front is quite narrow. In New York and other cities, there are similar buildings that were built at the fork of two roads. When the house was built, 900 people lived in Hattingen. Since 1590 the city has been surrounded by a protective wall. Citizens could enter the city trough five gates. The most important buildings were the St. George’s Church and the old city hall from 1576 on the Untermarkt. Both buildings still exist today and 330 meters of the city walls have been preserved. Now Hattingen has 56.000 inhabitants. The carvings above the entrance are special: The bar at the top right show figures and objects like ducks, grapes and flowers. On the left side of the house, the beams look like grim faces, which are to ward off evil. Over the door is a desire of the builder: Wilhelm Elling asks for God’s blessing and protection from disease and fire for his friends. Today there are more than 140 half-timbered houses in Hattingen, numerous are protected as monuments. After the Second World War the local heritage society of Hattingen bought the Flat Iron House. 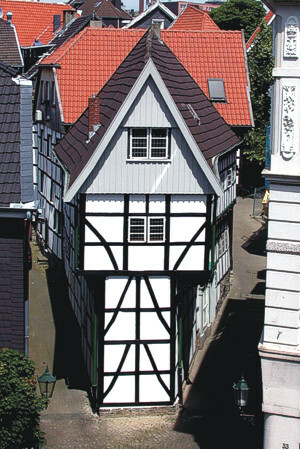 It is the first half-timbered house in Hattingen, which was renovated after 1945. The house has been a museum for more than 50 years. In 2016 the museum opens from 23th April to 4th December. The museum is open every Saturday and Sunday from 3 to 6 p.m.